Before the Makeover The kitchen in this Minnetonka house has plenty of positive features, including oak cabinets and lots of storage. But they were overwhelmed by a strong country theme, including heavily patterned wallpaper and cabinets that needed updating. "The wallpaper really dominated this room," said Lori Matzke of Centerstagehome.com. "Buyers will get so hung up on that they won't notice or remember anything else about it." Get rid of the wallpaper. The wallpaper was cleaned, primed and painted with a textured roller in a soft taupe color. Typically, Matzke doesn't recommend painting over wallpaper, but "in a small area like this it's the lesser of two evils." 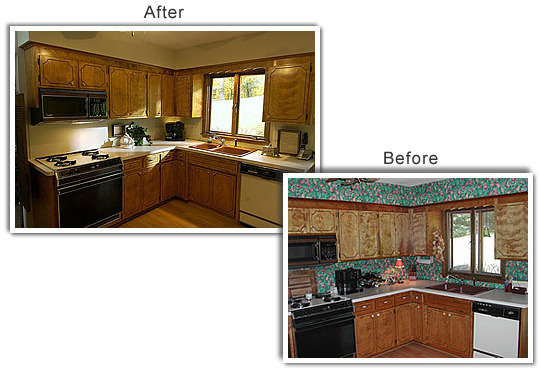 The new paint color more closely matched the countertops, which had begun to show their wear. "You create a continuous flow of color and draw less attention to the flawed countertops," she said. Displaying simple accessories is another way to downplay those counters. Revive the cabinets. After washing the cabinets with a grease-cutting cleaner, Matzke applied an orange-oil product, let it soak in for several hours and polished the doors with a soft cloth to give the cabinets a fresh luster. Update the hardware. Matzke spent about $50 on new brushed-nickel knobs and pulls that replaced the old ceramic hardware, giving the cabinets a fresher look. "If you want your kitchen to compete with newer homes on the market, adding new hardware is a noticeable upgrade that will easily pay for itself." Make the space feel brighter. Removing the window screens is an easy way to increase the amount of natural light that comes into the room, making the space feel much brighter. Airy, light-filled rooms are always a good selling point, Matzke said, but remember to mark the screens so that they can easily be replaced by the new owners.